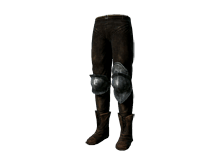 Boots worn by Drangleic infantry. A piece of basic, minimal equipment. At least it's light and easy-to-use. Sold by Maughlin the Armourer. Part of the Infantry Set.